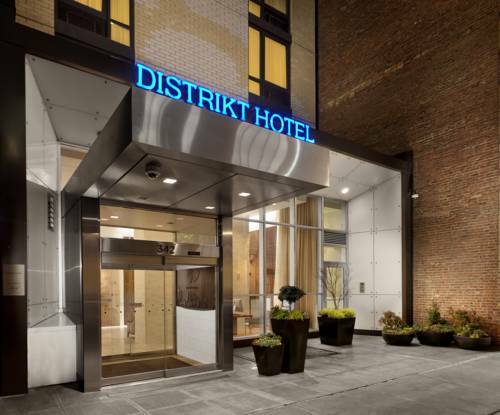 Focus on your destination at the Distrikt Hotel New York City, an Ascend Hotel Collection Member near Times Square. Attractions like Broadway, Central Park, New York City Civic Center, Madison Square Garden and MetLife Stadium are all nearby. Enjoy amenities like free WiFi, a flat-screen TV and a desk. Also, earn rewards including free nights and gift cards with our Choice Privileges Rewards program. Valet Parking is available at a rate of 60.00 USD per 24 hour period for standard vehicles and 70.00 USD per 24 hour period for oversize vehicles, including SUVs. Off-Site Self Parking is available at a rate of 45.00 USD per 24 hour period for standard vehicles and 55.00 USD per 24 hour period for oversize vehicles, including SUVs. Guest must be 21 years of age or older to rent guest rooms.